One of my most memorable introductions to a perfume happened in Mexico, when a child-shopkeeper handed me, with grace and a touch of theatricality, a bottle of original Bel Ami by Hermès. It was not love at first sniff (even though I bought a bottle immediately) but now, if some evil genie commanded I use only five perfumes for the rest of my life, Bel Ami would be one of the five…even one of three (if the genie were especially nasty and restrictive). I was excited to try the tweaked Bel Ami — Bel Ami Vétiver — but was wondering if the light touch of perfumer Jean-Claude Ellena would make the perfume too contemporary for me. With a bottle of original Bel Ami in one hand, and a sample of new Bel Ami Vétiver in the other…here goes! Original Bel Ami is a dark, dramatically “grained” leather perfume (think buffalo hide instead of a sleek Hermès purse); original Bel Ami pulsates with sticky resins, beautiful floral glimmers and glints, some smoke (birch tar), moss, and rich cedar-vanilla. Gorgeous is a word I rarely use to describe a fragrance…but Bel Ami, old-style, is gorgeous. I respect the entire Bel Ami family: original, current formulation, and Bel Ami Vétiver (already on my to-buy list). But respect is one thing, “love” another. In Perfumeland, original Bel Ami has few competitors for my heart – it “met” me on a perfect, sunny day in Old Tijuana, introduced by a charming child. (I wasn't too much past childhood myself back then.) I remember lots of details about the short bus ride from Mexico back to the U.S. entry point: it was night but the sky was orange with many lights illuminating the border zone; it was hot; the rickety bus's windows were all open, letting the dusty air float all around us; I was dying of thirst; and my friend, sitting next to me, said, “Damn, you smell goooooood!” Bel Ami! Hermès Bel Ami Vétiver is available in 100 ml Eau de Toilette, $125. 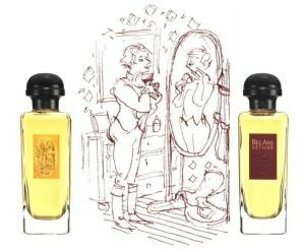 Note: top, center image: a drawing from Hermès Bel Ami Vétiver packaging. Ahhh I so want to be the first commenter on your great reviews at least once Kevin! It is so good to know that men’s perfumery is not dead yet and that there is at least one new men’s fragrance that floated your boat recently! E: yes, a rarity! Ha! Your nice review of Bel Ami Vetiver makes me want to make a new purchase. Haven’t had that feeling in a while Kevin! E, you’re welcome…and I am itching to buy something, too. Kevin , you made my lunch hour feel like a mini vacation. What a sweet tale! My border town was Nogales. In the mid 70s we would drive over for vanilla, rum, hippie blouses, Lladro (I know) and for me, Bal a Versailles. The best perfume store was a huge room, three stories high and pink! Go big? Go pink! It was wonderful! You helped me access that old memory and I thank you. Now, to try your Bel Ami Vetiver! I had to Google “Lladro.” That’s cute that you guys were crossing the border to buy porcelain figurines! Kindcrow/ JJ…Lladro was a BIG deal in Tijuana as well…as a child I am ashamed to admit I wanted this figurine of an 18th century man…complete with stockings and beauty mark…powdered wig…of course! I believe there was a greyhound involved too. I don’t remember why I had such Grandma-taste back then. I still have my little brown bear with the forlorn face. Glad that you were lured in too. Spending a day across the border was always great fun. Juicejones, glad to have helped revive that memory ! I hope BAV gets here SOON. Kevin this sounds fantastic! I tend to confuse Equipage and Bel Ami. What is the main difference? Though both are ‘powerful’ scents, I seem to remember them both fading quite fast on me so the added oomph would be a plus! Merlin, Bel Ami and Equipage are SO different…I have always powersprayed them…a few strategic spritzes won’t last all day. They have vetiver, bergamot and oak moss in common, but, I probably run them together because I always see them on the same shelf as Rocabar and Eau d’Hermes! Been wanting to sniff this and the original Bel Ami! Haven’t sniffed either! Wonderful perfume love story, Kevin! I tried Bel Ami recently on a scent strip and thought it smelled GREAT. It had a cragginess that made me think it was ideal for male skin. Nonetheless, I liked Ellen’s Epice Marine very much, and I love vetiver, so I’m very interested to smell Bel Ami Vetiver. Also glad you’ve gotten to test another worthy scent! Noz…I still have not smelled Epice Marine! Hey Kevin — nice review. I like that Hermès seems to be doing justice to its old workhorses (Hermes. Horses. See what I did there?) in refreshing them. It might be the kind of thing that rekindles interest in them for a younger crowd. Be that as it may, I didn’t fall in love with Bel Ami the couple times I’ve tried it. I think it’s too much of a “macho” for me. Kind of the way Chanel Antaeus was way, WAY too much for me. I’ll try it again some day, and maybe this vetiver iteration as well. I remember vividly your original review story about buying your original Bel Ami in a dusty, tiny little shop in Tijuana. This review is a nice epilogue. Joe: HA! “Macho!” … something I’ve never been accused of! I went back and read my Antaeus review and see that you said in the comments you were going to try a new bottle of it…did you ever try the current formulation? I think it’s WAY less macho than it used to be. Bel Ami Vetiver is still masculine to my nose, but maybe a tad less than current Bel Ami (original Bel Ami was muy macho, for sure). Thanks for the lovely review Kevin. Anyway, is there any Vetiver Tonka dna in Bel Ami Vetiver? You mention it turns slightly sweet and “toasted” and that made me think of Vetiver Tonka. How do they relate? Lupo…there must be cumin in each of those…never trust a list of ingredients! Ha! I need to resniff Vetiver Tonka next to this one…there is some nuttiness, scentwise, in each…sweetness too.